The Mirozh Icon appeared at the Mirozh monastery in the year 1198. But later, during the reign of Ivan the Terrible, at a time when a plague raged at Pskov, an ancient report tells how tears flowed from both eyes of the icon. Many benefits and healings for man occured from the icon of the Mother of God." The Mirozh Icon is an "Orans" ("Praying") type. On either side of the Most Holy Theotokos stand the Pskov Saints: on the right, the holy Prince Dovmont-Timothy (May 20); on the left, his wife, the holy nun Martha, in the world named Maria Dimitrievna (November 8, 1300). Tsar Ivan Vasilievich took away the wonderworking icon from Pskov, but at the monastery an exact copy remained: the so-called "Great Panagia" from the Savior-Mirozh monastery. 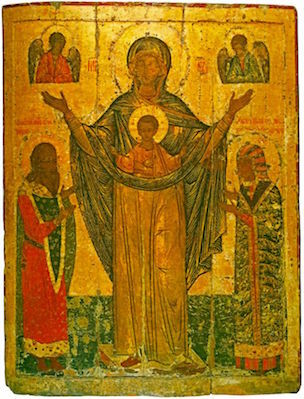 On September 24, 1567, on the Feast of St Abraham at the Mirozh monastery there occurred a miraculous sign from an ancient icon of the Most Holy Theotokos. The celebration of the Mirozh Icon of the Sign was established in that same year, with the blessing of Archbishop Pimen of Novgorod and Pskov. A special service to this icon was composed, and was published in the 1666 MENAION.